This book has been designed as a self-contained introductory course for anyone who wished to gain a knowledge of the original language of the Sikh scriptures. Those to whom it is a addressed are naturally expected to have an interest in and a concern for the teachings of Sikhism, but it has not been assumed that they will necessarily possess any specialized linguistic knowledge. It is also hoped, however, that users who do possess some knowledge of the modern language will benefit from working through the book. The course is divided into three parts. 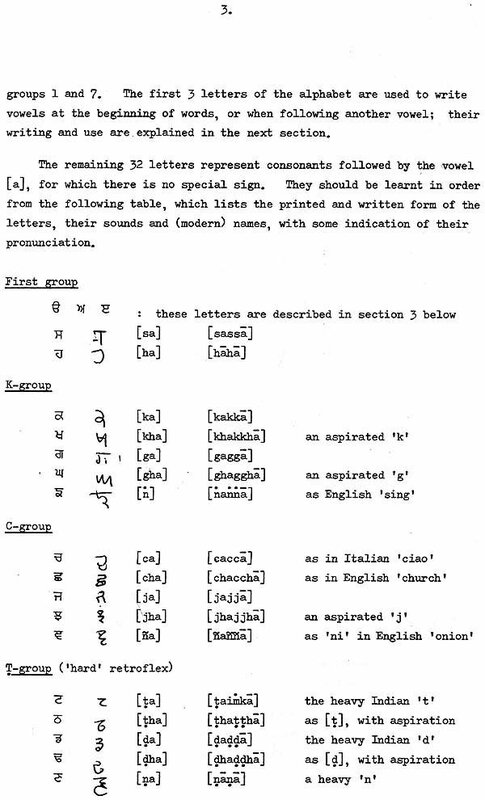 Part-I comprises a brief introduction to the Gurmukhi script, with the aid of a simple system of Roman transliteration. 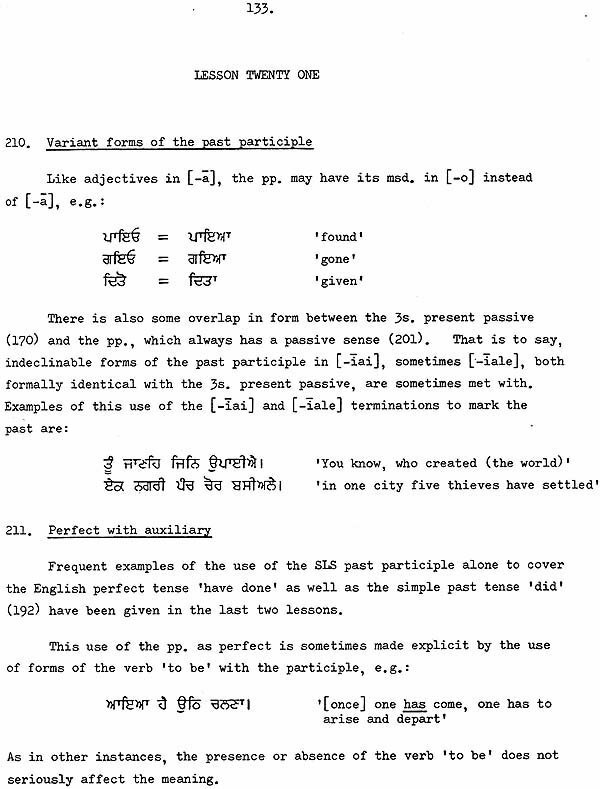 The aim has bean to teach the antique conventions of 17th century Gurmukhi spelling, which differs in some respects from modern Punjabi orthography. The script should be thoroughly mastered before proceeding further since the use of the Roman script is later kept to a minimum. This book has been designed as a self-contained introductory course for anyone who wishes to gain a knowledge of the original language of the Sikh scriptures. Those to whom it is addressed are naturally expected to have an interest in and a concern for the teachings of Sikhism, but it has not been assumed that they will necessarily possess any specialized linguistic knowledge. The course has indeed been intended primarily for those who know neither the Gurmukhi script nor modern Panjabi. It is also hoped, however, that users who do possess some knowledge of the modern language will benefit from working through the book. The course is divided into three parts. 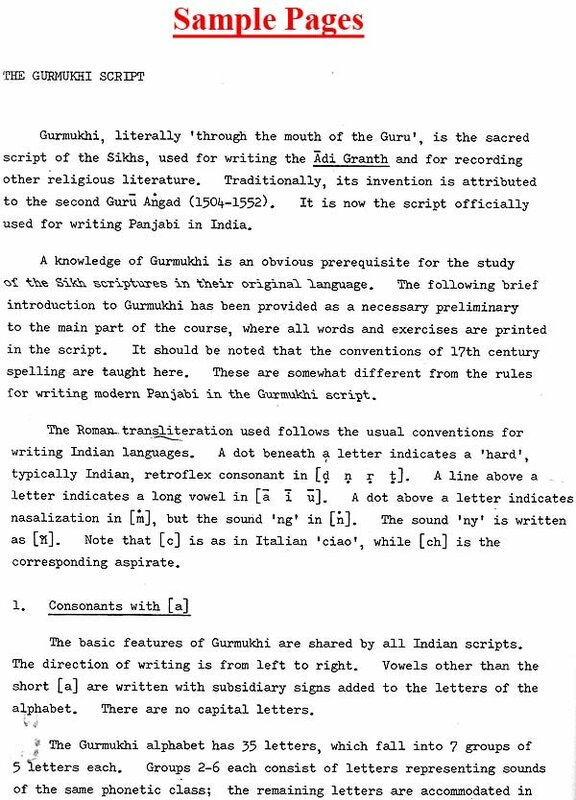 Part I comprises a brief introduction to the Gurmukhi script, with the aid of a simple system of Roman transliteration. The aim has been to teach the antique conventions of 17th century Gurmukhi spelling, which differs in some respects from modern Panjabi orthography. The script should be thoroughly mastered before proceeding further, since the use of the Roman script is later kept to a minimum. The bulk of the course consists of the 24 lessons of Part II. These are designed to introduce the grammar of the language of the Sikh scriptures in a graded sequence, beginning with the simplest forms and constructions, then gradually working through the more complex ones. Each lesson concludes with a vocabulary of newly introduced words, to be learnt by heart on their first appearance, followed by two exercises. One is a simple grammatical exercise for completion in the Gurmukhi script, the second a longer exercise in translation. 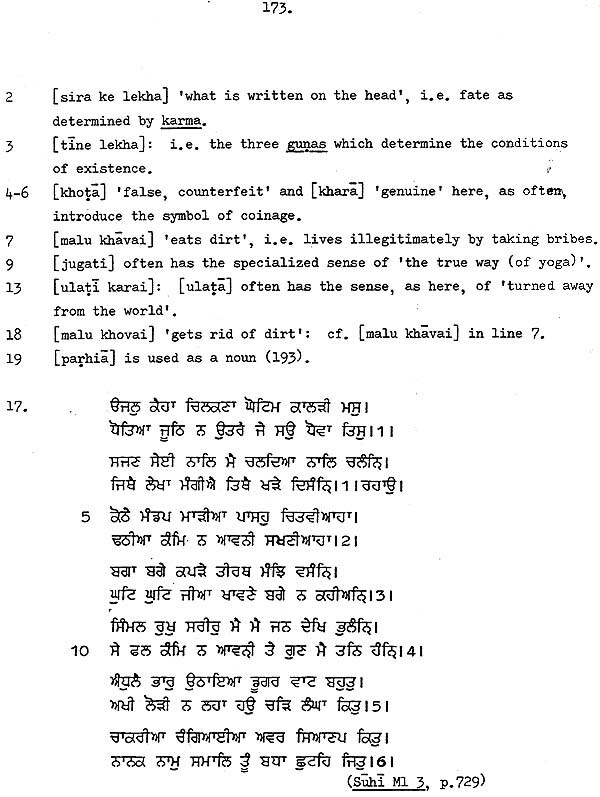 All the verses provided for translation have been taken directly from the compositions of Guru Nanak, brief notes having been supplied where the original text might appear ambiguous. References are also supplied in an appendix, for use by those who wish to consult translations or commentaries. The language of the Guru Granth Sahib, as taught here, is of very mixed character, since it draws upon a variety of local languages and dialects, as well as incorporating a good many archaic forms and words. In these respects it is entirely typical of the written languages in which the religious literatures of medieval India are mostly recorded. 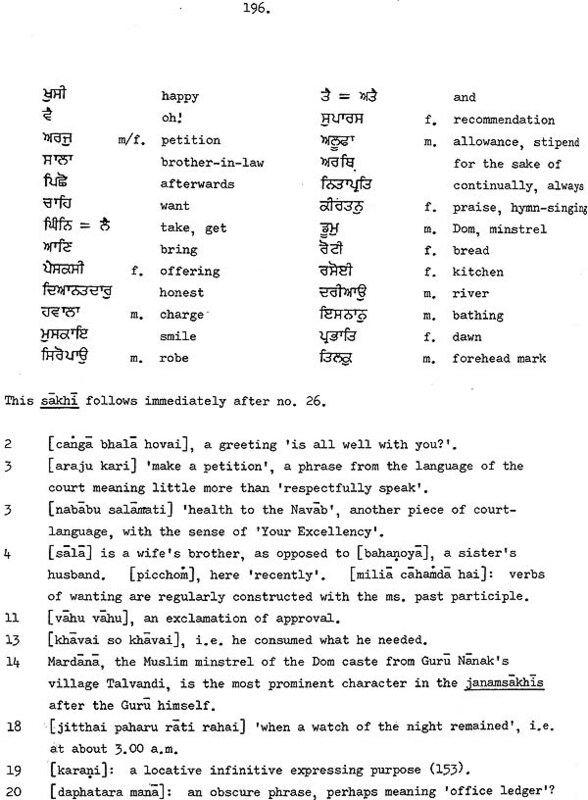 In order to avoid misleadingly simplified titles like 'Old Panjabi', the language has been referred to here as 'the sacred language of the Sikhs', abbreviated as SLS. No attempt is made in the course to distinguish between the different local forms so frequently encountered as synonyms in SLS. Stress has rather been laid upon the basic grammatical categories into which the various forms fit, so that a newly introduced variant can readily be slotted into the appropriate category beside the more common equivalents already learnt.There are, for example, at least ten forms each in SLS corresponding to the English words 'is' and 'are'; it is much easier to learn these if the basic grammatical categories of the third person singular and plural of the present tense have been properly grasped. Careful attention should therefore be paid to each grammatical term as it is introduced. The grammatical tables ~ given at various points in Part II list most of the forms which will be commonly encountered and may be used for subsequent reference (cf. Lesson 14 for nouns, 15 for adjectives, 16 for pronouns, and 18 and 24 for verbs). 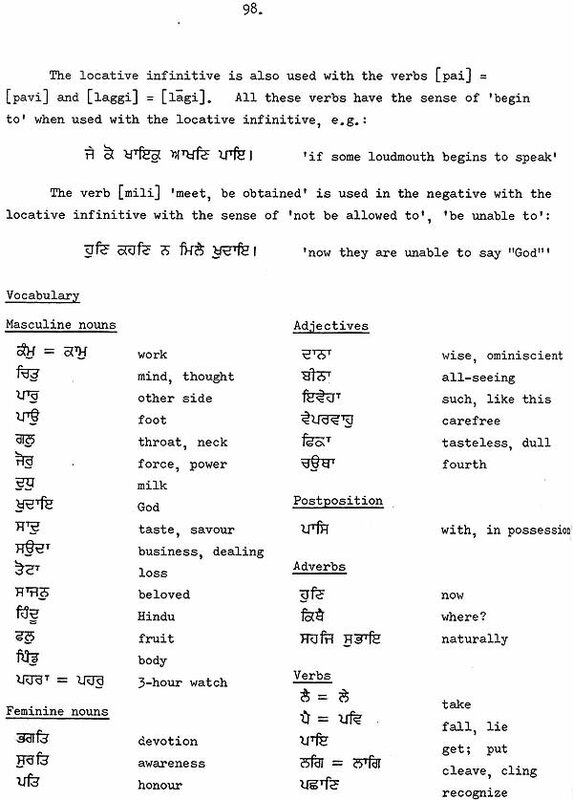 The composite language here referred to as SLS was used by the Sikh Gurus for the bulk of their compositions from the time of Guru Nanak (1469- 1539) down to the period of the original compilation of the Guru Granth Shib in 1604 by the fifth Guru Arjan. 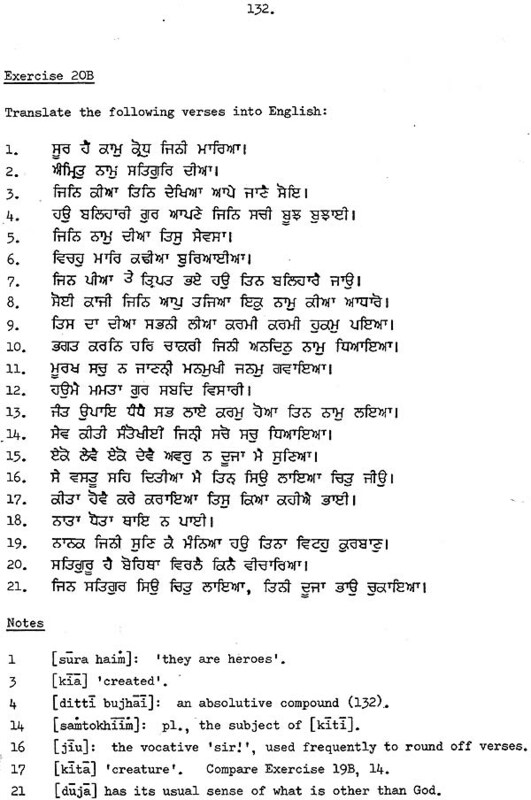 Although the language of the other saint- poets, such as Kabir and Namdev, whose compositions were included by Guru Arjan in the Guru Granth Shib, is generally very similar in character to that employed by the Sikh Gurus, no special attempt has been made to include a full description of the distinctive local grammatical forms encountered in their verses. A language similar to that of the Sikh Gurus is found in the verse vars of Guru Arjan's close associate Bhai Gurdas (d. 1637). The language of the 17th century hagiographies of Guru Nanak known as janamsakhis is also similar to the verse SLS of the Gurus. 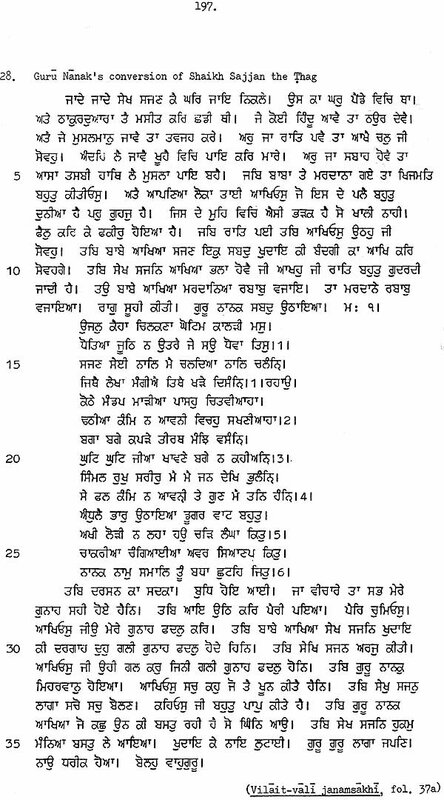 The fact that these hagiographies are written in prose does, however, naturally entail some differences: and one may also detect in them a partial transition to a simpler modern language (a feature also characteristic of the compositions of Guru Arjan when compared with those of Guru Nanak). Part III of the course has been designed as a short introductory reader to the main varieties of early Sikh religious literature. Extended extracts are provided from the works of Guru Nanak, with a few examples taken from those of his successors and from Bhai Gurdas. 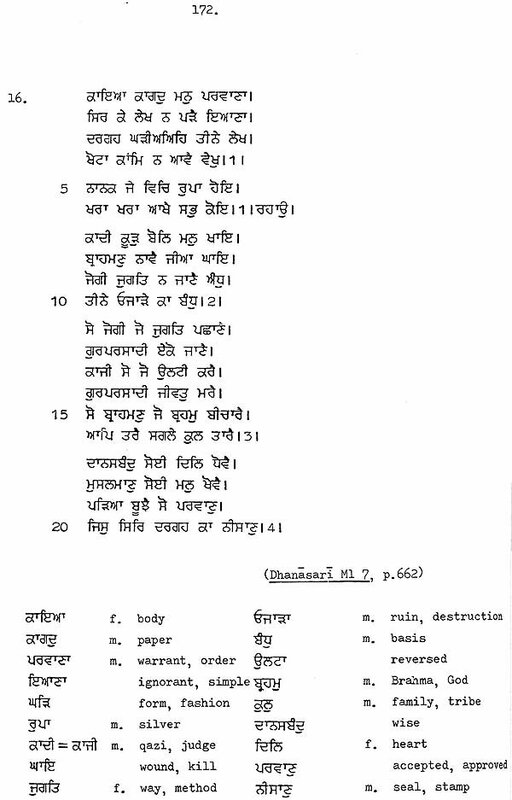 The course concludes with some typical extracts from a janamsakhi, prefaced by a short explanation of the principal distinctive features of the language of this genre. All the passages in Part III are accompanied by vocabularies and notes. 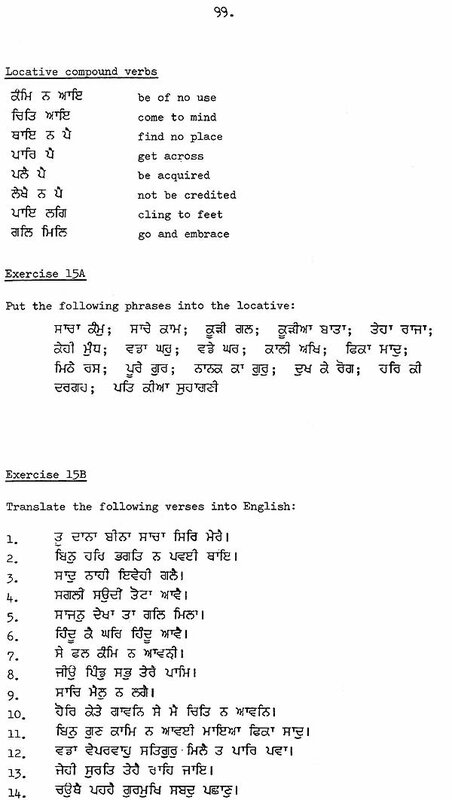 After the entire course has been worked through, most early Sikh literature should be accessible in the original, with the help of the available English translations and such aids as my previously compiled A Guru Nanak Glossary (London: SOAS, 1981), from which the present book has grown. 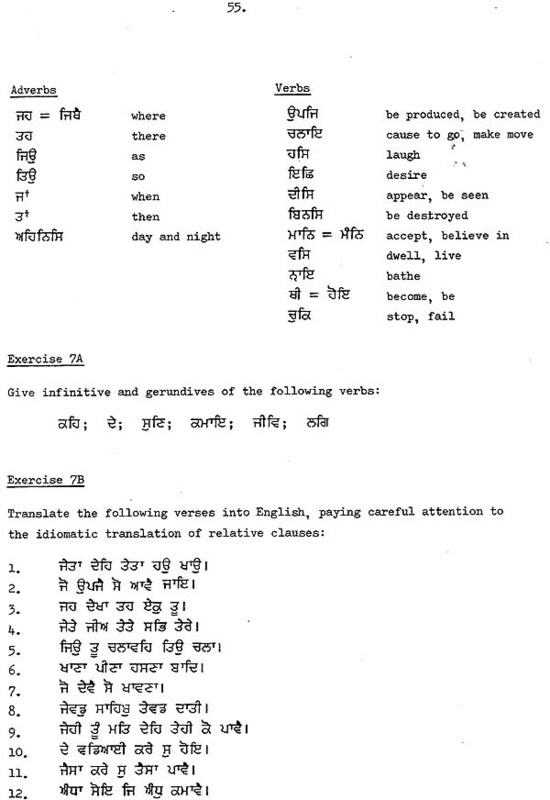 It may finally be pointed out that the course has not been designed to serve as an introduction to the language of later Sikh religious writings. 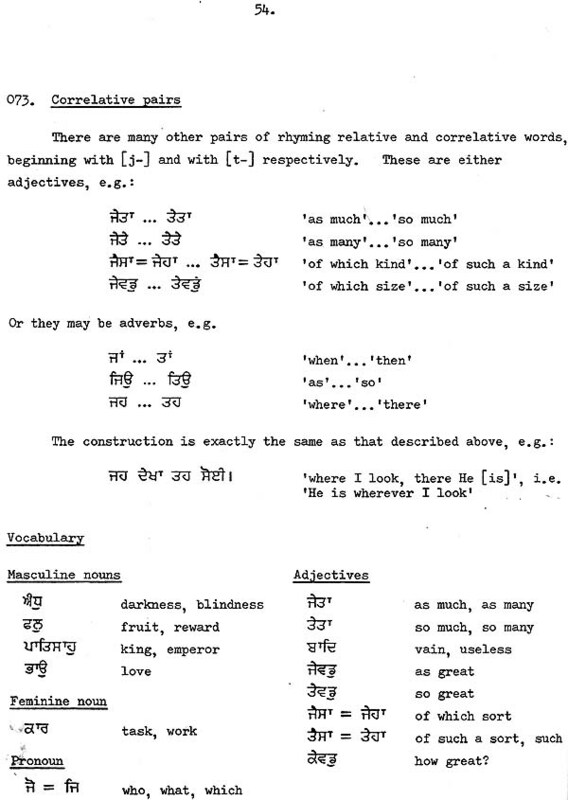 While still written in the sacred Gurmukhi script, these are largely composed not in the old SLS but in the Braj variety of Hindi, the principal component of the language of the Dasam Granth of the tenth Guru Gobind Singh (1666- 1708). With the Sikh renaissance of the later 19th century, this in turn gave way to modern standard Panjabi, the chief medium of expression for modern Sikh thought and scholarship. My thanks are due to Dr. Owen Cole and to Upkar Kaur Ubhi, who both worked through the first draft of the course, and who made many valuable suggestions, both explicit and implicit, for its improvement.